WINTER LOBSTER STEW | Jane Lear. Writing on Food and Travel. Sound conservation methods and unusually warm (yeesh) weather resulted in a record lobster harvest off the coast of Maine this year. The deals at seafood markets and lobster pounds were impossible to resist, and consequently Sam and I ate our fair share of the sweet, succulent meat on carcass-strewn newspaper-lined tables from New York to New England and back. We ate some mighty good lobster. But winter is when I like lobster (a.k.a. Homarus americanus) the best. The meat is firmer and, well, meatier, with a deep oceanic tang. It tastes like the cold blue water of the Gulf of Maine, and just thinking of that amazing body of water makes me realize that soon it will be time for tiny, tender Maine shrimp. But not yet. 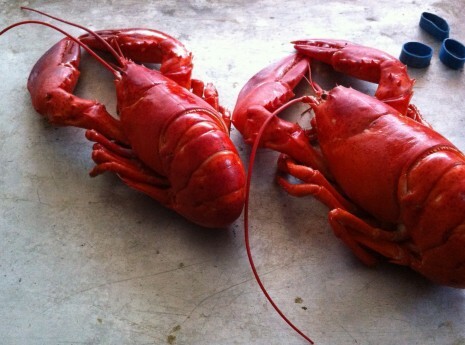 Because the price for lobster is still reasonable at my local seafood market, the other day, I carried home two belligerent beauts and, not wanting to prolong the agony for any of us, cooked them immediately. Once they cooled, I picked, pried, or leveraged every bit of meat out of the shells. First I considered making a thick chowder, chunky with potatoes and some frozen fresh corn.That gorgeous meat, though, needed very little help. So, instead, I made lobster stew, which is far plainer than chowder. It’s the sort of dish that manages to combine an almost austere simplicity with warming good cheer, and if you can bear to delay gratification, it is even better when made a day ahead. In fact, if you are the type of person who always harumphs when a food writer or chef carries on about the virtues of “marrying flavors,” then make a lobster stew, and eat some of it of it immediately. After refrigerating the rest of it for a day or so, taste it again and get back to me. The procedure below is inspired in part by the three-sentence recipe published in America Cooks, by Cora, Rose, and Bob Brown and published in 1940 (“Cut up and fry lobster meat in butter. Then turn into scalding hot milk, season with butter, salt, pepper, and paprika. Let stand awhile before serving, to bring out the full flavor.”) and John Thorne’s Serious Pig annotations, enormously helpful to any nonexpert lobster-stew maker. 1. Bring about 4 quarts salted water to a boil in a large pot. Add the lobsters head first and cover the pot. Begin timing just when the water returns to a boil; I find it takes 8 to 10 minutes for two 1½-pounders. Fish them out with tongs and transfer them to a platter or large bowl to cool and catch any juices. Now, my advice here is to stop and eat lunch before removing the lobster meat from the shells; it’s far easier to avoid temptation that way, and it gives the crustaceans a chance to cool completely. 2. Divest the lobsters of every scrap of meat you can possibly coax or wrestle out of the nooks and crannies. Save the greenish liverlike tomalley if you like; it’s delicious stirred into the stew, but do be aware that it is where contaminants accumulate. If your lobsters are female, you might also discover the red coral, or roe. Definitely save that—it will add depth of flavor and a beautiful luster to the stew. Because the tomalley and coral are highly perishable even when cooked, refrigerate them and plan to serve the stew the very next day. Cut the large pieces of tail and claw meat into largish but still bite-size pieces. 3. Melt the butter in a large skillet over moderately high heat and add the onion and parsley; sauté until the onion is translucent and softened, a few minutes. Stir in the cayenne and a little of the tomalley/roe if using. Add the lobster meat and hotten it up. 4. Meanwhile, heat the half-and-half in a medium saucepan until it almost simmers (do not let it boil). Scrape all that good stuff in the skillet into the half-and-half and season with salt. Let the stew cool completely, uncovered, before stowing it, covered, in the refrigerator, and know that tomorrow night’s supper will be sublime. 5. Reheat the stew over low heat. Meanwhile, gently warm the leftover tomalley/coral in a bowl set over a small pot of simmering water; once it’s warmed through, stir it into the stew. Season with salt and pepper, serve with the toast, and be blissful. We were in New England the last two weeks of the summer; I packed in a year’s worth of lobster eating during those weeks. I’m reliving it as I read this post! My father-in-law makes an almost identical lobster stew…simplicity is key.